Soy products such as soy milk and tofu have become really popular in western countries. They are healthier substitution for meat products, since soybeans are great source of protein while being low fat and rich in minerals. There are a range of foods made from soybeans in Japan other than tofu. Vegetarian or not, Japan is a place to go to load yourself with soy products. Tofu is soy bean curd. But what is bean curd anyway? Actually it is fixed soy milk. Soybeans are soaked in water to soften. Then, you grind and strain the soybeans to make soy milk. You add bettern (the solution after crystallization of salt from seawater) to make it set. When set, that is tofu. So, you are basically eating soy milk when you eat tofu. No wonder it is considered very healthy substitution of meat! 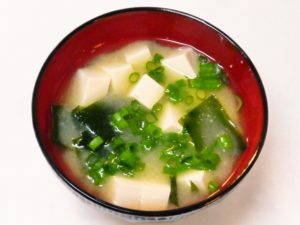 Miso soup is made by adding miso paste to boiling water. The short answer is it is fermented soybeans, rice and/or barley. First you make what is called “koji” which is made by mixing malted soybeans, rice and/or barley. Then you add salt to it to make miso. There are different types of miso. Some uses only rice malt, while others use rice and barley or soybeans, rice and barley. The color of miso ranges from light wheat straw color to dark chocolate color. The extent of fermentation in addition to the color produced by ingredients influence the color. When making miso soup at home, make sure to use “dashi” along with it to get maximum umami, the savory flavor. Have you ever seen natto? If you have, you belong to the courageous group of people who don’t judge foods by their looks and smell. Natto keeps the shape of soybeans, though they have sticky threads around them and they taste a bit tangy. You boil soybeans until they are soft, then ferment them adding natto fungus. Normally you put it on top of warm rice and eat them together. I love natto, of course. It is tasty, savory and very good for you. There are varieties with different sizes of soybeans, but all of them have strong umami that makes them quite addictive. But did you know Edamame is also soybeans? They are young green soybeans in the pod before turning whitish brown. Boil it for a few minutes and sprinkle salt before serving. I like edamame not only because they taste good, but also because of the fact that when you eat soybeans when they are green, they count as vegetables! Soy sauce or shoyu is made from soybeans and wheat. Strictly speaking it is not food, but I am including it because it is not fair to mention this world famous condiment when mentioning family of Japanese soy products. 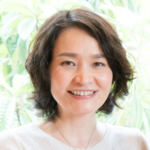 Just like miso, you mix rice malt and what malt with salted water. Then, it is fermented in a warm shed. When you squeeze it after one year or so, you get soy sauce! Oh, by the way, we also eat soybeans simply by cooking them in broth. The dish is called “nimame”. I’d say it is hard not to eat soy products in every meal, if you are in Japan. Unless of course you’d rather eat in western fast food restaurants. 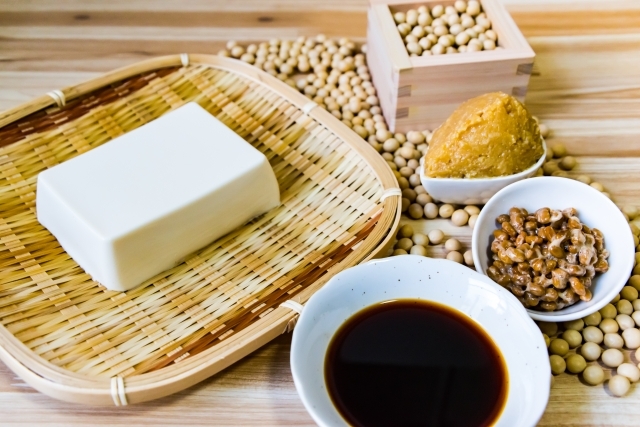 Enjoy the nutritious and tasty selection of soy foods in your trip to Japan!